Detroit's expanding appeal to visitors opens a niche for personal adventures led by residents earning side income as tour guides. Travel entrepreneurs offer activities such as a Southwest Detroit art walk, a Dearborn coffeehouse visit for "stories of Yemen and its culture" and a look at honeybee hives on Detroit's east side. They and 14 others are posted through a nearly three-year-old program called Airbnb Experiences -- open to anyone, whether renting from an Airbnb host or not. Detroit was part of a pilot program launched in November 2016 with a dozen cities. It "targets millennials looking for authentic experiences who would rather stay in a cool neighborhood than a hotel and have been the early adopters of Airbnb," Sherri Welch wrote in Crain's Detroit Business two years ago. There has been some churn among local guides, particularly in the music category. Hip-hop producer Nick Speed no longer offers to socialize for $50 to $200 at his studio and dance clubs, and Adriel Thorntoning dropped a six-hour "taste of Detroit's techno and house scene." Similarly, Kid Rock guitarist Kenny Olson sticks to music-making without leading two-day "Motor City Rocks" tours for $375. 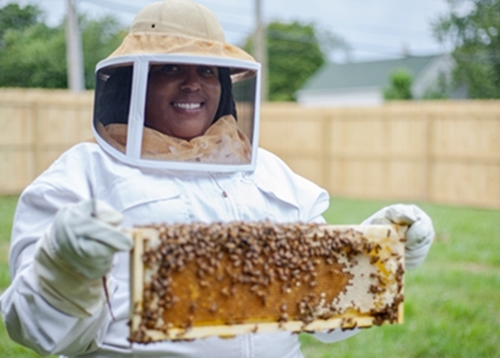 Nicole Lindsey offers honey-making demonstrations at Detroit Hives.